About : Completely revised and updated, this guide features more than 850 miles of trails for discovering Glacier and Waterton Lakes. 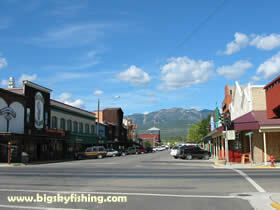 Whitefish started rather late in life as far as towns go. While people had been living around the area of Whitefish prior to the arrival of the railroad, primarily engaged in logging, no official town existed. However, in 1901, The Great Northern Railway announced it would build through what is now Whitefish and establish a new division point. Following this announcement, over the next 3 years, clearing for a new town site was done and materials for the construction of the site flowed in. In 1904, the Great Northern Railway officially arrived in Whitefish – marking the official date of the birth of Whitefish. Whitefish was initially called “Stumptown”, and for good reason. Before the arrival of the railroad and people, the area around Whitefish was heavily wooded (and still is today). To make room for a town site, a huge number of trees were cut down, leaving stumps behind. These stumps created problems almost immediately in the form of creating traffic problems and making it a pain for new additional construction – as all these stumps had to be painfully removed. Happily, the name “Stumptown” never really stuck – with the official name becoming Whitefish a few years later. 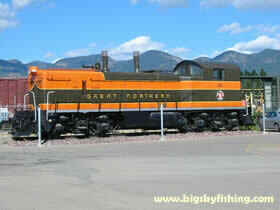 Whitefish, as it dated to the arrival of the Great Northern Railroad, was not surprisingly a railroad town. The first buildings were built around the railroad – and for much of the next 40 years – the railroad would be one of the towns’ biggest employers. Additional industry in and around Whitefish consisted mainly of logging – done up in the thickly forested mountains and hills that lie just outside of town. Following the arrival of the railroad, Whitefish grew quickly. The influx of railroad workers, loggers and trappers combined to give Whitefish a solid foundation (unlike many of the boom/bust mining towns that died off once the gold ran out). Yet, despite its beautiful location at the base of a big mountain and having a beautiful lake a “long stones” throw away from downtown, Whitefish for most of the 20th century remained a quiet place. While employment with the railroad declined a bit over the years, new industries to cater to tourists helped keep Whitefish relatively healthy economically. Then, beginning in the 1980’s – and accelerating in the 1990’s and 2000’s – Whitefish started to get recognized for its spectacular setting. The towns close proximity to Glacier National Park, the ski area that lied just out of town and a general boom in “trophy home” construction that happened throughout Montana in the 1990’s and 2000’s, greatly fueled the town’s growth. The Great Recession of 2008 put a damper on development in Whitefish; however, it in no way stopped it. And despite a slow economy nationwide, Whitefish itself fared quite well during and after the Great Recession. Due to the towns beautiful location and nice downtown area, it is almost a certainty growth in and around Whitefish will continue in the years ahead.